Undisputed Cruiserweight World Champion Oleksandr Usyk will defend his WBC, IBF, WBA, WBO and Ring Magazine belts against Tony Bellew at Manchester Arena on November 10, live on Sky Sports Box Office in the UK and DAZN in the US. Pound-for-pound star Usyk made history by outclassing Murat Gassiev to become the first Cruiserweight to hold all four recognised belts, following his sensational World Boxing Super Series win in July. The 31-year-old won Olympic, World and European amateur golds before steamrolling his way to the top of the Cruiserweight division after only 15 fights, but former WBC World Champion Bellew believes he will become the first man to beat Usyk on November 10. A glittering career has seen Bellew win British, Commonwealth, European and World titles, and the Liverpudlian warrior is aiming for a fairytale ending in Manchester, hinting that this could be his final battle before he retires. “This is the ultimate test for me,” said Bellew. 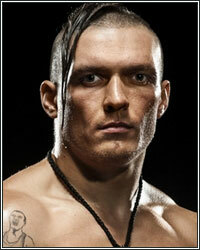 “There is no greater test than Oleksandr Usyk, he is one of the most feared men in boxing. This is nothing new to me, everyone says that I can’t do it again. Everyone is saying that I’ll get beat-up quickly, but we’ll find out won’t we. “Make no mistake, I know this is the most dangerous fight of my life but I’m also going into this with my eyes wide open, I’m not in awe of Usyk. I won’t stand and admire him and allow him to rattle off five-punch combinations on my head. “He’s meeting someone now who’s just as quick as him, someone that’s competed at a division lighter than him and someone that’s come across fighters much more powerful than him. “It’s an absolute honour to promote Britain’s first ever undisputed title fight in the history of the sport,” said Eddie Hearn. “This one of the biggest and best fights in boxing with Tony Bellew daring to be great against one of the top pound-for-pounders in the sport in Oleksandr Usyk. “I cannot wait for this fight,” said Alex Krassyuk of K2 Promotions. “Two lionhearted warriors will collide for all of the Cruiserweight World titles. This is fight that the World has been waiting for and I’m delighted to be part of history in the making. “Many experts don’t give Tony a chance in this fight but he has proved many times that being an underdog does not mean being a loser. I can’t see Usyk having an easy walk in the park on November 10. This is the biggest opportunity of Tony’s career and he has nothing to lose, this makes him very dangerous. An announcement on ticket prices and on sale dates will be made in due course.